My Threadbear Life: Hotties, Hearts & Wine . . .
"Oh I do hope you have some hotwater bottle covers in stock as my dear wife would like to buy one??" I find the pastel blankets are always popular with everyone . . .
as well as a bright cheery Golly one that could be suitable for either boys or girls. After the New Year came & went, I began the massive task of sorting through my "mountain" of craft magazines! I am sure many of you crafty readers can relate to this statement? 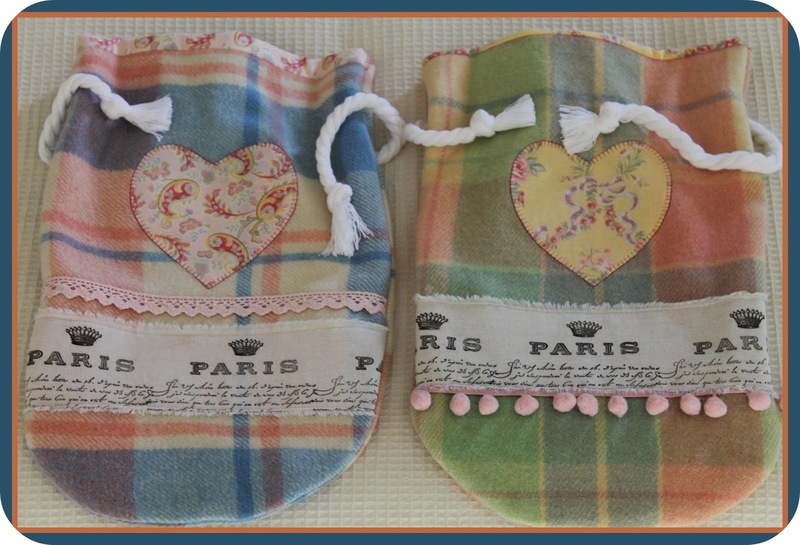 I came across an old Country Threads edition (Vol 6 No 7) in which I had long ago earmarked the "heart bowl fillers" pattern by Michelle Bentley. The Mr announced he was going to make wine this year !!!! This is rather unusual for 2 main reasons . 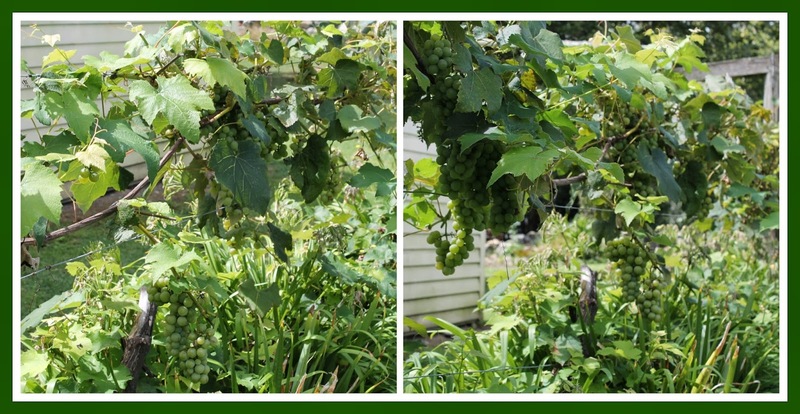 . .
- firstly : we have lived here now for 17 years & every single year when the grapes are ready he announces he is going to make wine . . . but has never actually done this !!!! - secondly : The Mr doesn't actually drink alcohol of any kind !!!! Although he assures me he knows what he is doing ..... I seriously have my doubts !!!!! I shall keep you posted on this venture dear readers. I asked my friend Jan if she ever came across any small size Agee Jars in her Op Shop travels to please let me know ... Jan very kindly offered me 6 jars she had sitting at home. I was able to make some more string jars as had sold some of the ones I did last year for the Cottage. 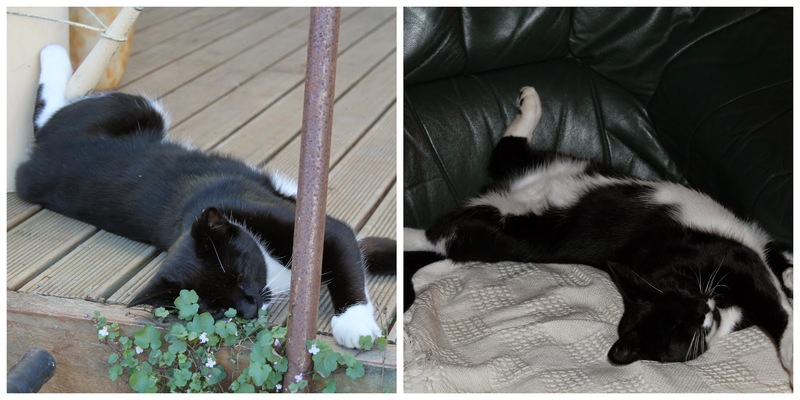 I shall leave you with this little collage of Blackie who, as you can see, continues to lead a rather stressfull existence here at my Threadbear life . . .
his absolute favourite pastime .... sleeping with one leg in the air !!!! What a busy little bee you have been and are you assistant wine maker? Or will you be the taster? Blackie is such a cruiser. Wow weeeee wine making aye? This will be interesting. I guess with all the extra groups and people going to visit your wee slice of paradise you need to make sure the cottage is bulging with tempting goodies..............will there be any left by the time I get there?? Yay, four more sleeps until I get to go shopping at the cottage!!! of the day...First of many! :). and ogling Blackie! It sure looks like a stressful life. held up to my lips...Well, we could'nt afford milk...! :>). a little taste..Who knows! None for Blackie mind! yesterday...Coming to finish off to~day..Looking good! Ha..ha... small selection eh! Very small..... 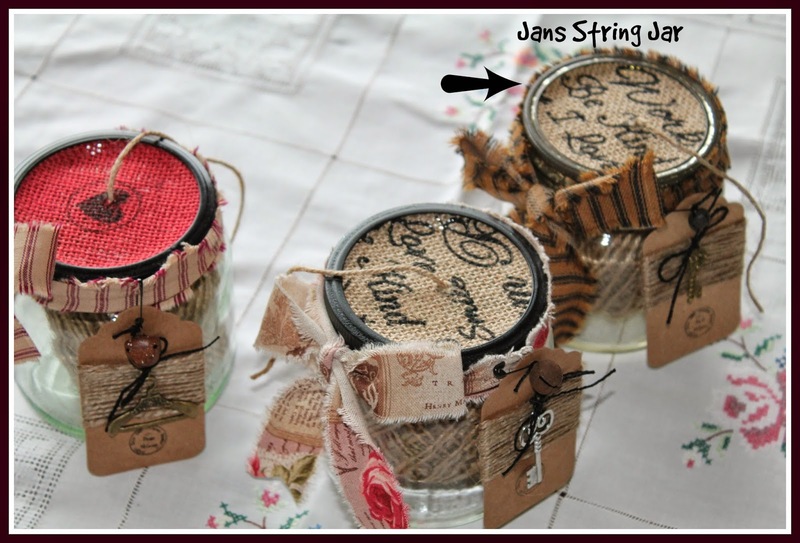 The string jars are really cool - practical and pretty. I remember at Bible College we made rhubarb champagne - still don't know why we thought that would be non- alcoholic - duh! Needless to say it blew up in the bathroom - everywhere!! My Mark doesn't drink either and was a bit embarrassed about the whole thing. 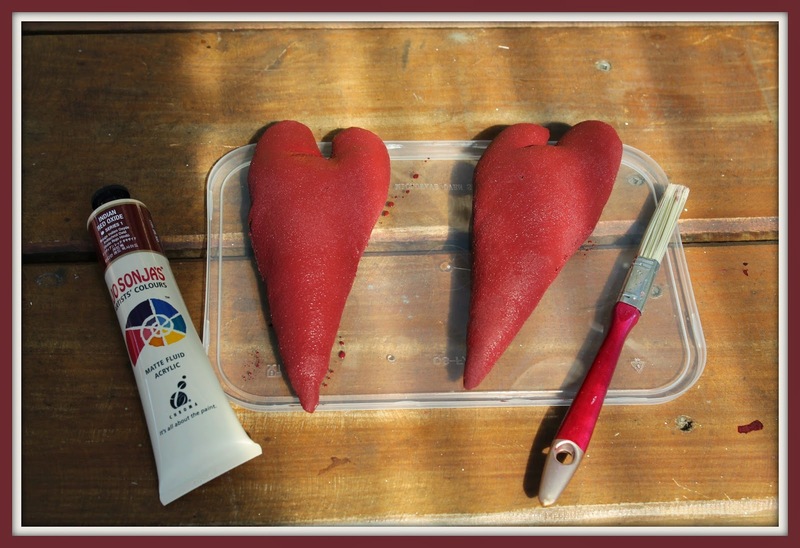 Love the primitive hearts - can you use any kind of acrylic? I'm really keen to try the crow thing now. I daren't open the cupboard with my old mags in - too scary! 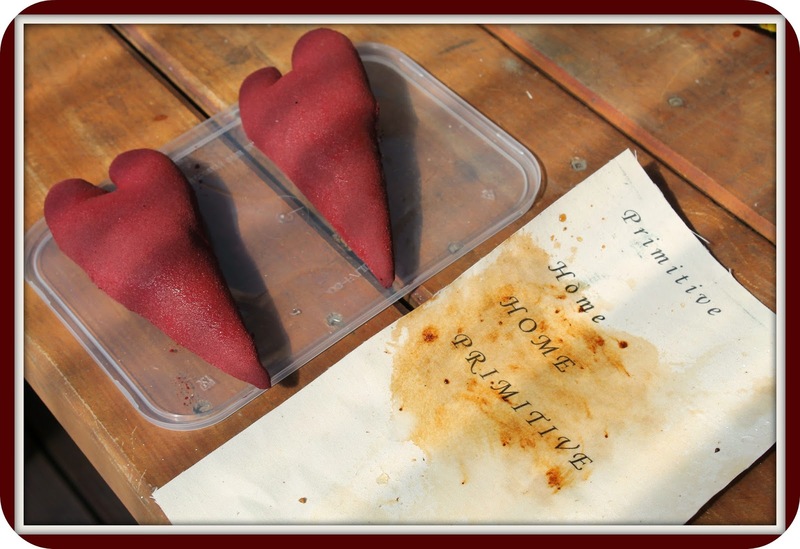 As ever a gorgeous post filled with oodles of pretties, Julie! 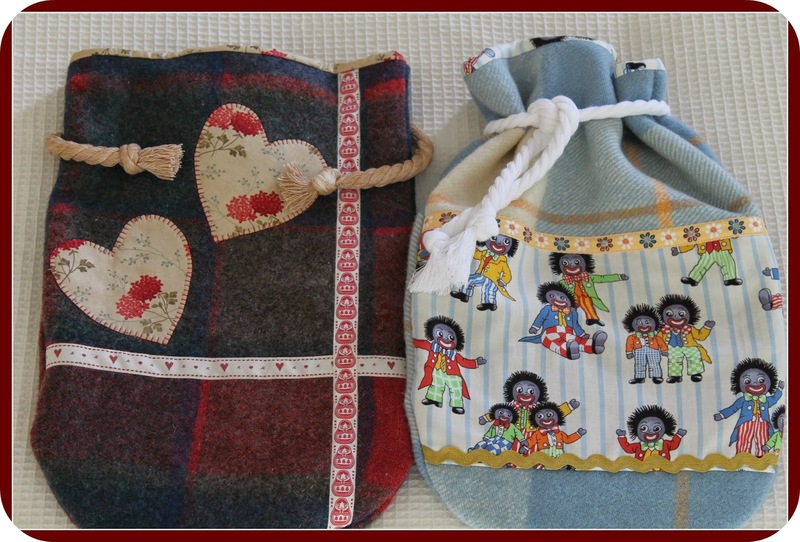 Love the blanket hot water bottle covers. Those hearts are really cool as are the string jars.....they look amazing. 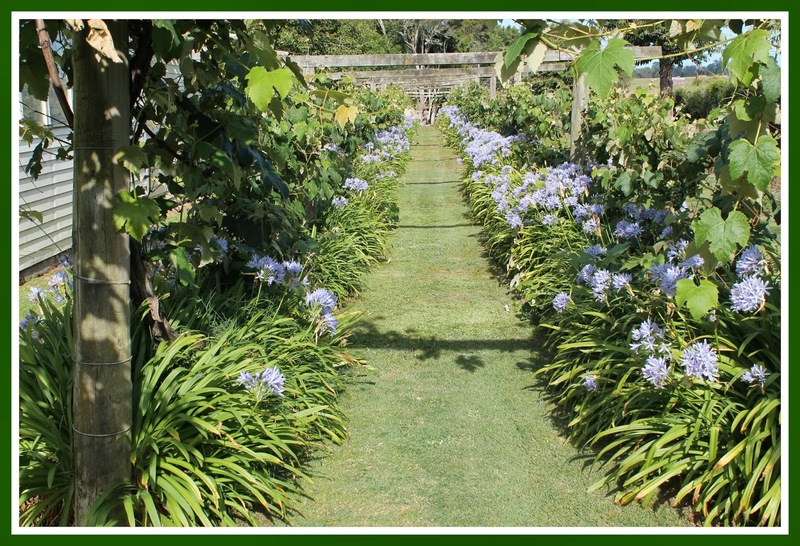 Those Agapanthus look all pretty in blue and there is something reassuring about a grape vine winding it's way across a garden. The wine sounds intriguing....you must have a tipple when it is all ready to go. How thoroughly relaxed does your Blackie look. Cats really do have the best life; they always seem to find the comfiest spot to doze away some of their nine lives!! Gorgeous! The hottie covers are beautiful and you always amaze me with the variety of crafting you do - the hearts and string holders are way cool :-) I've been wondering what to do with our excess grapes too - feeding them to the pig and the sheep seems a little extreme, but I don't see wine making as a new hobby! Lovely to see Blackie stretched out and relaxed! Well I guess you can say you can't lead a man to drink but he will eventually make wine! Hope it tastes great and you have a great vintage, I think that's what wine people say. 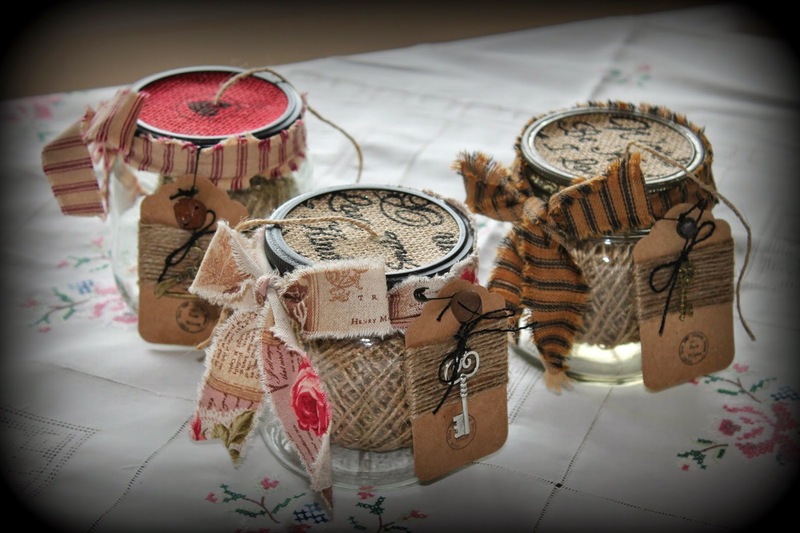 I do like the string jars, they would be good for crochet balls to as long as the jar is big enough. Enjoy the vintage cars and the drivers on the weekend. Ooh, you're so creative! 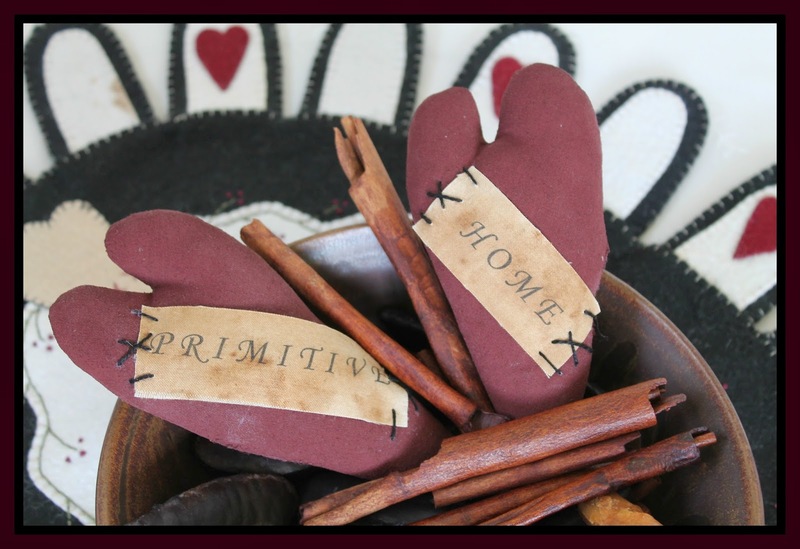 I love the primitive hearts. My daughter and I create similar ones. 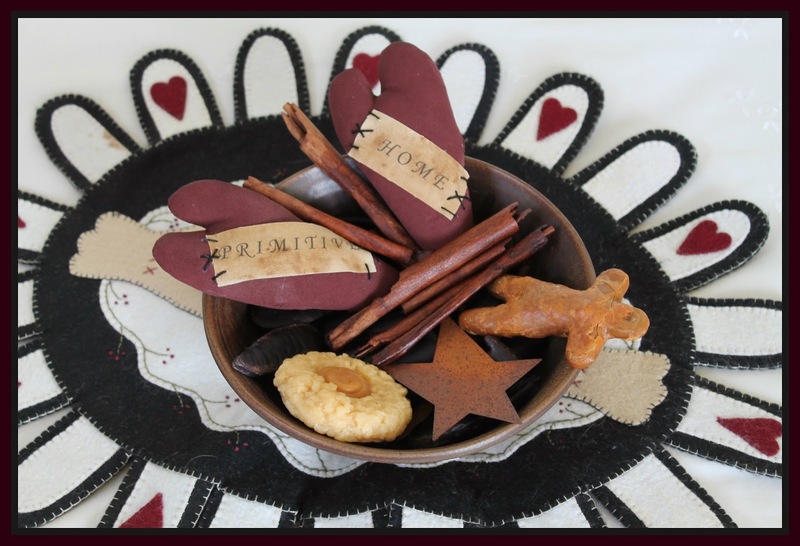 Thank You Yvonne - I too, love the simplicity of the prim hearts - think I will make some more this winter. Oh Julie I jist love those heart bowl fillers. I havent made any in ages and these get me wanting to make prims. Now that cat has the right life!!! We just got back from visiting with my dad on his ranch and that is exactly what we looked like for 5 days Hahaha. Happy Autumn. Goodness Julie, Blackie's quite well camouflaged on that leather couch. Wouldn't want to sit on him inadvertently : O Good rescue on the hearts. I guess the coffee aroma would blend quite nicely with cinnamon & clove scents. Your hottie covers are always a delight. Didn't the lovely dark blanket come up nicely....for a bloke. The point is....do YOU drink wine my dear? Hope it's a grand vintage then if you do! 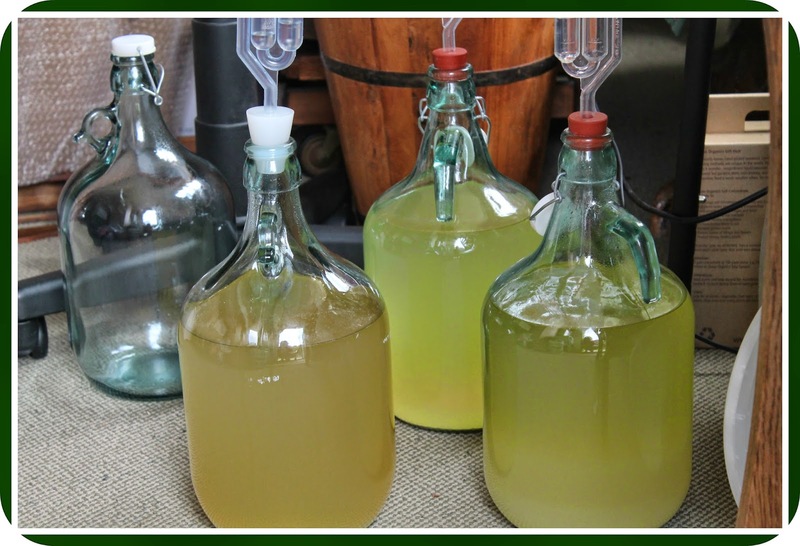 Nice colours in those flagons so far : ) It's quite fun & hopefully rewarding making plonk! Lovely, balmy autumn days here, hope you have too.